We are starting the second group of the Blogging Marathon 8th Edition. It's going to be a big group of 21 bloggers for the second group. I hope you enjoy will enjoy this session also. My first week was Cooking without Fire for Kids and I actually managed to make 7 different dishes that were so well received by my kids. So I am sure I will be making them again for them. Coming to the second group, I decided to do a 3 day of Microwave Cooking and 4 days of Condiments. Yes you guessed it right, if not like this I might never make any dish for my own events. 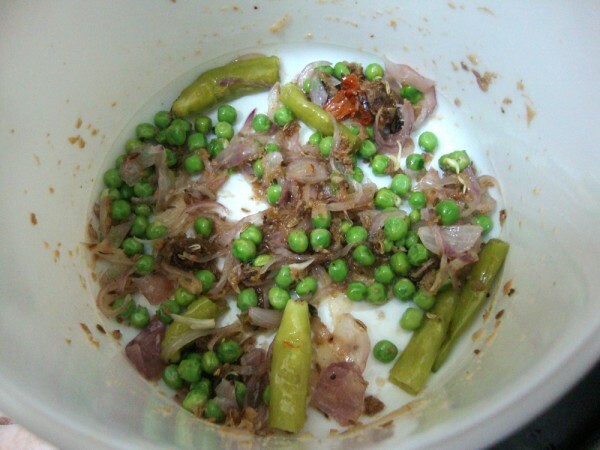 I am celebrating 4th year anniversary of Microwave Easy Cooking. As I had said earlier, my aim for to create an event that will be helpful for working folks. Initially my thoughts were to have something to do with Lunch Box Recipes. But later based on reader's choice, decided to have one with Microwave. 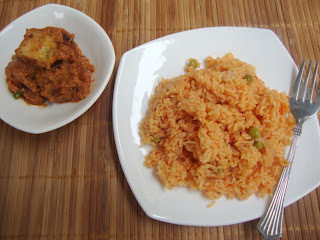 I have my own Lunch Box recipes that I was posting every week for almost 3 years. I want to be regular in posting those, but starting a Microwave Easy Cooking Event, I never really realized the event will get into it's 5th year! For the better part of my microwave usage of my old mw oven, I mostly used it for re heating etc. But after I got my new one, I made sure I make the best. I never realized how easy and useful it has been since. Even when I am not working entirely in my microwave, I use it extensively as a help to my regular stove top cooking. I mostly boil my vegetables in microwave. 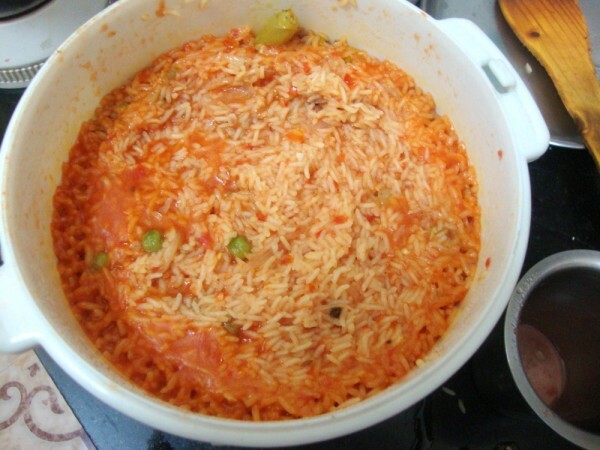 But just for the event and to generally use the microwave oven more, I end up making the entire dish in the oven. Since I have a Microwave Convection Oven, most recipes come with a combination mode of cooking. But I wanted to concentrate on recipes that are done only microwave mode. 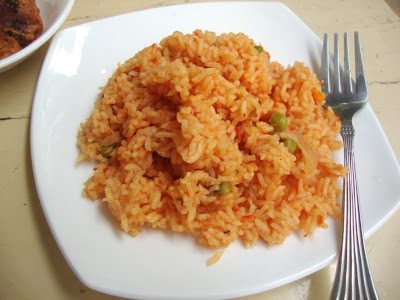 Tomato Pulao is a favorite at home and since I wanted to make some party dish, this naturally came to mind. 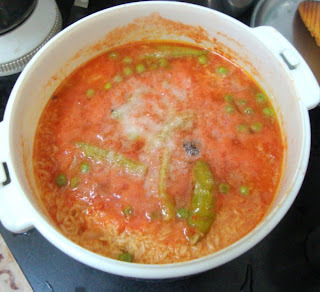 I made this for Sunday lunch and none could recognize that it was completely made in microwave. I also make Thakkali Sadam which is a favorite mixed rice variety. 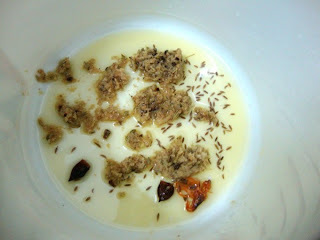 Add 2 tsp ghee, 1 tsp oil in a microwave safe bowl along with cumin seeds, javathri. Microwave for 2 mins. 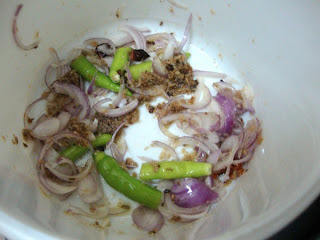 Remove and add the ground spices, micro for 2 mins. the ground masala was very stiff, maybe 1 min is fine. Remove add onions, green chiles and micro for 2 mins. After 2 mins, it looks like this. 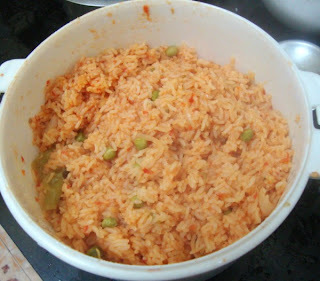 Washed Rice that was soaked for 15 mins. This is after 15 mins. Served with Aloo Paneer Kofta curry, our Sunday lunch. - Make about 1 & 1/2 tsp of paste. Make a coarse paste of the spices to be ground. Puree the tomatoes and keep it aside. 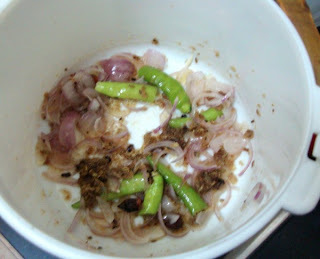 In a microwave safe bowl, add ghee and oil. 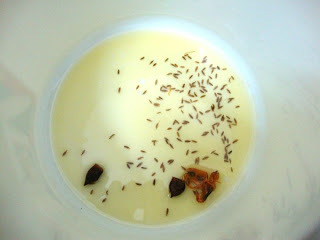 Add cumin seeds, javathri. Micro for 2 mins. 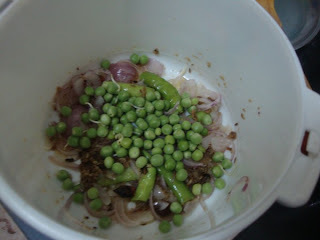 Then add onions julienne and slit the green chillies. Micro for 2 mins. Followed by the ground masala for 2 mins. Once done, add fresh peas and micro for 2 mins. 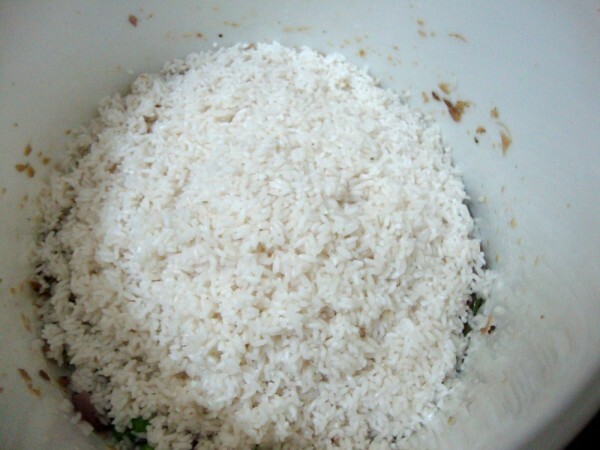 Drain the rice and add to the bowl. Mix everything well. then add the tomato puree which is added to 4 glass of water. If you are using regular rice, you can use 1: 2 ratio, if you are using Basmati, then make it 1 & 1/2 cups. 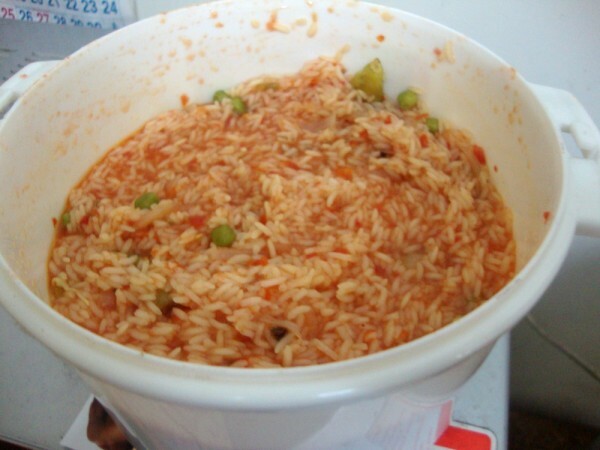 When you add tomato puree, the water measurement will increase, so take care. 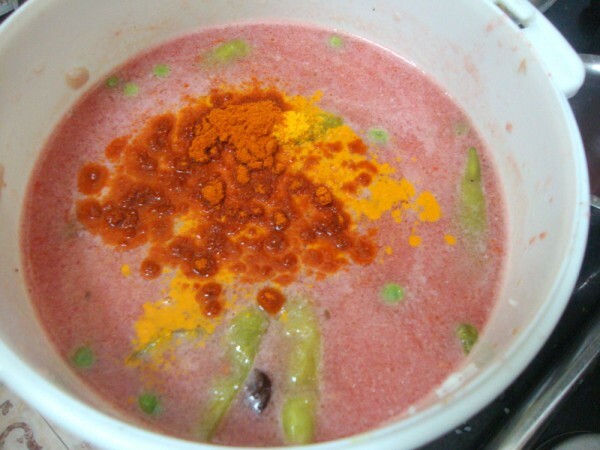 Add chili powder and turmeric. Salt should be added in the last 10 mins of cooking. Check after 10 mins is done, stir well and keep it back. 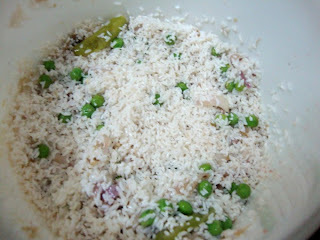 After 15 mins, remove, add salt and mix well. Micro again for the remaining time. If required you can microwave for 5 more mins. Once done, keep it closed for 5 mins. This way the rice gets done well. This goes for my MEC : Potluck party to celebrate my Microwave Easy Cooking Event Anniversary! Do join me in the celebrations.